Leave the premises immediately, opening doors and windows and extinguishing any open flames, if possible. Do not unplug or plug in any electrical appliances, or turn off or on any light switches. This can cause a spark that could touch off a gas fire. Call SDG&E (Emergency number: 1-800-411-7343) or 9-1-1 from a neighbor’s phone. Operating a telephone in your home can also cause a spark. Do not smoke or light matches near your home. And be careful with some flashlights, as turning them on may cause a spark. Do not re-enter your home until a gas company official has inspected the premises, made any necessary repairs, and deemed it safe. To help prevent a gas leak it is important to make sure your gas appliances are properly installed and vented, and kept clean and in good working order. 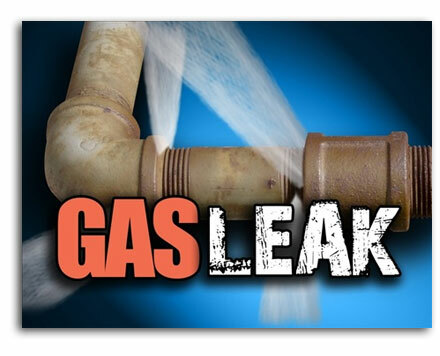 Annual inspections by a qualified San Diego gas leak technician also are recommended. To reduce a chance of fire, be sure to keep all combustible materials away from furnaces, water heaters, ranges or other gas appliances. For additional peace of mind, an easy-to-install home gas detector unit can be purchased at home centers for $35 to $50. Typical gas detectors will identify methane and propane gas. A separate detector is needed to detect carbon monoxide and can be purchased for $45-$50. Gas detectors are especially recommended for the elderly or anyone with a diminished sense of smell. To set up an appointment by a qualified gas leak technician, please call our qualified team of professionals at (619) 463-1600.